If you have toyed with the idea of applying an epoxy floor coating in Arizona, then you are probably wondering how this kind of floor can benefit you. What makes it different than other concrete floor coatings? There are plenty of them out there, but this one stands out above all the rest, and there are plenty of reasons why. Other floors may certainly be appealing to you, but maybe they just don’t hold up to your standards. If you have chosen epoxy floors over another kind of concrete coating, then you should know what you are signing up for. Here are the top five benefits of epoxy floors. 1. Concrete floors are great for industrial use. They aren’t too horrible looking, and they are extremely durable. But they are not indestructible. Over the years, regular traffic and use can damage them quite a bit. With Epoxy floors in Queen Creek, it provides a shield that is resistant to impacts and heavy crashes, making your floors last much longer than they normally would. Epoxy floors are also resistant to spills, chemicals, and other wear that might happen over time. This will save you a ton of money on floor repairs in the future, and that is why epoxy floors are the most popular of industrial and commercial use. 2. If you have a regular concrete flooring, it is much more susceptible to chemicals and other fluids that could damage it. This is because concrete is porous and it can absorb most of these liquids and damage your concrete. With an epoxy floor coating in Queen Creek, you will have a low-friction surface that makes cleaning up these spills and messes much easier than it would be on regular concrete. As it creates a smoother surface, mopping and sweeping are much simpler to perform and it can even make your site much safer and cleaner due to easy clean up of contaminants and other dangerous materials. 3. When you have finally decided on the epoxy floor coating, your epoxy floor contractor in Queen Creek will have an easy job ahead. Epoxy floor coatings are much easier to install than a lot of other kinds of concrete floors. It goes right over the top of your already laid concrete, and that means you won’t have to reduce production and stop everything just to have a floor installed. Because of simple installation, it is also relatively cost effective, and it is probably the best choice for you whenever you decide to ultimately utilize this kind of floor in your commercial business, or home environment. 4. Also, an epoxy coating is perfect for improving work morale. A lot of the time, dull, boring surroundings can decrease the work your employees get done because they are not working in an environment that is pleasing to the eye. You see this a lot in plain, office environments with neutrally colored walls and unpleasant carpet or tile. An epoxy floor increases the aesthetic in your work environment and boosts morale around the workspace. Plus, with color tinting technology, you can color code the industrial work space for use of certain types of machinery, optimizing workflow and making it much easier for operation in the space. 5. Finally, epoxy is environmentally friendly. If you are a green conscious person, then you will love epoxy floor coatings. With a reduction in material usage, this is the perfect option for adding on to your already existing concrete floor. Instead of destroying and making new, it simply covers the concrete, also repairing and cracks and damage that have occurred over time. It reduces the use of materials needed to maintain and repair it, making it the most cost effective solution. It is also much more forgiving on your existing machinery, especially tires. Regular concrete can grind against the tires and wear them down, but an epoxy coating is much smoother and will not create so much damage. 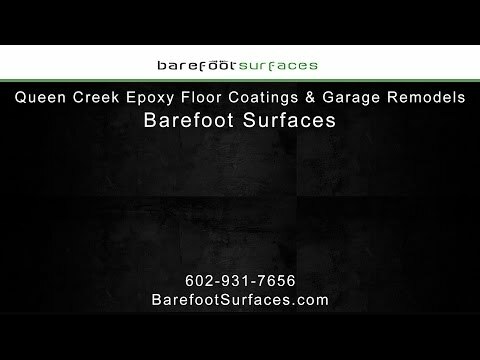 If you are considering an epoxy concrete coating for your industrial and commercial use in Arizona, talk to an epoxy contractor at Barefoot Surfaces, where we can provide you with the skill and knowledge to add an epoxy coating to your existing concrete floors. With our expert patio epoxy contractors in Queen Creek, your satisfaction will be guaranteed, and you will certainly be pleased with your new, professionally installed epoxy coating. For more information about our extensive range of services, contact us today!